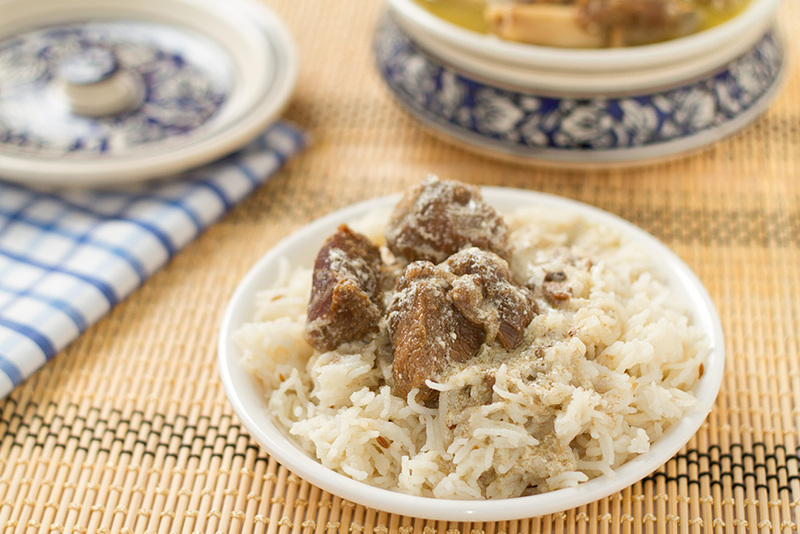 Kashmiri Yakhni Mutton is a simple to make, mild, thin and delicious curry which is best served with steamed rice. Yakhni is a yoghurt based gravy and does not have turmeric or red chilli powder. I use fresh green chilli for the mild peppery flavor, but you can skip it. Bay leaves, cloves, cardamoms and fennel seeds lend primary flavors to this curry. Things to remember while making this curry is not to roast the fennel seeds and other masalas, and stirring the curd continuously after you add it to the gravy till it starts boiling and then switching off the heat immediately. This curry tastes best when made fresh. Heat 3.5 Tbsp ghee in a pressure pan and add crushed black cardamoms, cinnamon stick, bay leaves, and mutton to it along with salt and Asafoetida and fry on high and medium flame till the water dries off. After the water has dried off, add ginger powder and about 250 ml water. Stir to mix everything well and add the fennel seeds powder. Cover the pressure pan, and keep the heat on high for 1 whistle, then lower the heat and cook for about 30 minutes or till the mutton cooks completely. Open the pressure pan only after the pressure drops completely. In another wok, take the remaining 1/2 Tbsp ghee, heat it and add to it cumin seeds and crushed cloves. Reduce the flame and add whipped yoghurt and continuously stir till the yoghurt mixture boils. Add this boiling yoghurt to the mutton gravy which should now be ready, and simmer everything for about 3-4 minutes. Serve immideately with steamed rice. 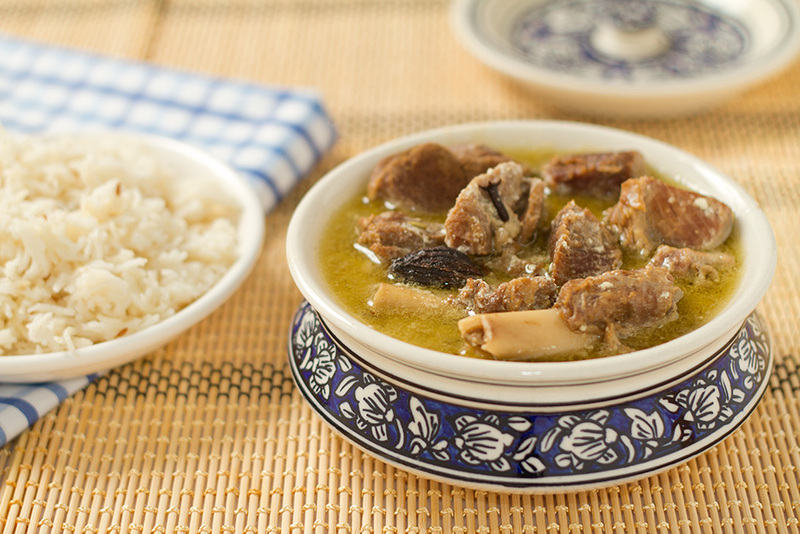 Kashmiri cuisine is based on the ancient traditions of the north-west Indian Kashmir area. The Rigveda mentions the meat eating traditions of this area while the ancient Kashmiri epic, the Nilamat Purana, records that Kashmiris were heavy meat eaters, a habit that persists to this day. The most notable ingredient in today’s Kashmir cuisine is mutton, of which there are over 30 varieties. Kashmiri Pandits have had the earliest influence on Kashmiri cuisine. Although Pandits in other parts of the subcontinent do not normally eat meat, the Pandits of Kashmir have always eaten all meat except beef, which is strictly forbidden. Since most Kashmiri Muslims are converts from this Pandit community, the Kashmiri Muslim Wazwan also never uses Beef. This is in keeping with the age old Kashmiri tradition known as Kashmiriyat, much of the cuisine is similar between Kashmiri Pandits and Kashmiri Muslims. The wazwans of Kashmiri Muslims had a strong emphasis on goat, whereas Kashmiri Pandits prefer Lamb. The epic Nilamat Purana records that the Brahmins of Kashmir have always been heavy eaters of lamb and mutton. Swati, i am a total beginner and i can say that your recipe inspired me to cook mutton today! It turned out really well, thank you. Thanks for the good tip. Will surely try it. A very simple and easy recipi i m from jmmu and i prepared it.it is very delicious. I think the important thing that needs to be mentioned is the kind of mutton to be used.Generally ribs or “Seena” is used for yakhni which has some fat and enhances the taste of the dish. Thanks for leaving the comment, will add.